The Bluenose Expo is already open! The kids run is tomorrow! And the big day is on Sunday! The time is here! I really don’t know where the time has gone; it seems like just yesterday I was meeting Erin Poirier, my coach, Cliff Matthews, and my support team, Pa Modou. Now, it is already marathon time! I’m one of those runners that gets major nervous before a run, so even typing this up is giving me butterflies in my stomach and making my legs feel gooey. I am so excited to run with 50+ people that will be sporting the bright green 2013 Love4Gambia t-shirts in support of the NSGA. It brings the meaning of running a marathon to a whole other level for me. Today, i would like to introduce Dr. Megan Aston (MA), a NSGA Board Member and love4gambia team runner who will be taking part in the Bluenose this weekend. She has done a phenomenal job fundraising, and we are so lucky to have her apart of the team! JP: So Megan, how did you become affiliated with the NSGA? MA: I became involved with the NSGA through both my work as an associate nursing professor at Dalhousie University and my involvement with Bedford United Church. Many of our nursing students travel to the Gambia through their summer teaching program and I personally began working with the NSGA in 2008 when I travelled to Sierra Leone a part of an HIV/AIDS screening and education program. My husband and daughter travelled to the Gambia with Bedford United church in 2009 and we were involved in lots of fundraising. Since then I have been a board member. JP: How long have you been a runner/walker? MA: I began running three years ago with my neighbor. My first event was the 5km resolution run in Halifax, and my second was with Team Love4Gambia 10k, BlueNose marathon. Since then I have run two half marathons. JP: How did you become involved with Team Love4Gambia? MA: I was inspired by Erin, who first ran across the Gambia in 2011. 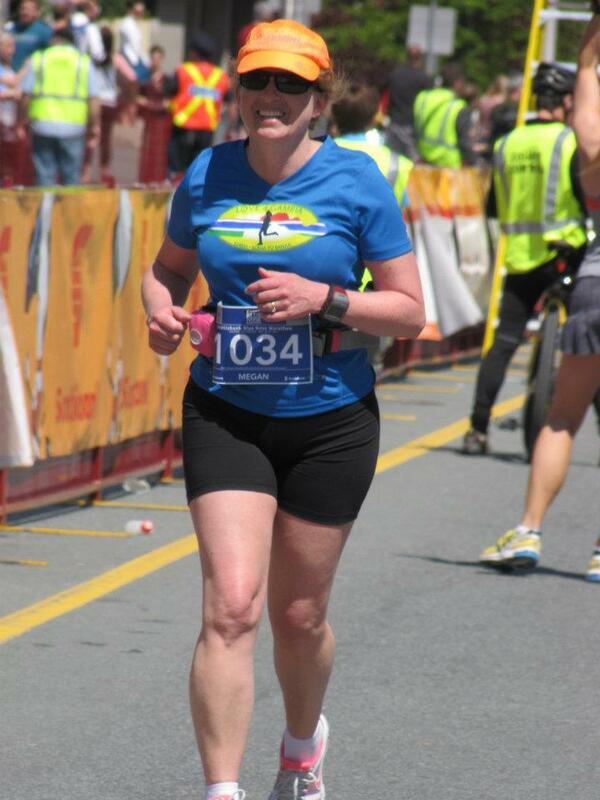 I knew her as a nursing student at Dalhousie, then an accomplished youth health nurse, and finally an amazing runner. JP: Why is it important to you to run for The Gambia as part of Team Love4Gambia? MA: Running/walking for Love4Gambia is a way to ‘advertise’ our cause as it is a common activity that most people can do. It connects people between the Gambia and Nova Scotia as we now have runners on both sides of the ocean who run for Love4Gambia every year. JP: If you ran or walked in the Bluenose run last year, can you share a highlight of your race? MA: I first ran in the Bluenose in 2011. I ran 10km that year and the highlight of my run was running towards the finish line with a group from Love4Gambia standing on the sidelines cheering me on and giving me high fives. I ran across the finish line crying I was so happy… happy to be part of this amazing experience and Love4Gambia. I raised about $500 that year. Last year, I ran a half marathon for Love4Gambia and raised over $1,000. This will be my third year running for Love4Gambia and I am so excited. JP: What?s been the easiest part of your training this cycle? MA: It is so easy to train as I run with my friends Jennifer and Kathy three mornings a week. JP: What?s been the most challenging part of training? MA: It has been challenging running in minus 10 degree!! JP: What is your favorite part of running/walking? MA: I love running with my friends and being part of Love4Gambia on race day. Our T-Shirts are awesome and they help us spread our message all over Halifax! JP: How do you keep motivated? MA: I am motivated by thinking I am privileged to live in Canada where I can run every day and stay healthy and strong. Being healthy in mind, body and spirit is important for all of us. Being able to ensure all of us have the opportunity to live our lives like this motivates me to keep going so I can raise money to help Love4Gambia. My friends and family are awesome and really keep me motivated… they are donating a lot of money…. And all I have to do is run! JP: What are you most looking forward to on race day? MA: I am looking forward to seeing our Love4Gambia supporters along the race route cheering us on as well as running with other runners in Love4Gambia and my friends. JP: What advice would you give to other runners to assist them in their training for the Blue Nose Marathon? MA: Remember that every time you run, you are running for Love4Gambia, no matter how fast or how slow your run! Enjoy each step, be very proud of yourself, and get ready to celebrate with other Love4Gambia supporters and runners on race day, at the beginning and end of the Bluenose marathon! JP: Great! Thanks for that Megan! Having a significant reason to run definitely makes it a lot easier and has been motivation for me as well as I prepare for the Bluenose and for Gambia. To support megan, please click here! For more information about team Love4Gambia at the Bluenose or to sign up to run with up, click here! Looking forward to the Bluenose 2013! Go team Love4Gambia (team green!) and have a great race! This entry was posted in Blue Nose Marathon, Fundraising and tagged Blue Nose Marathon, Charity Team, Megan Aston, Nova Scotia-Gambia Association, The Gambia. Bookmark the permalink.